Some items come along that you never knew that you needed. The Rivers to Seas Travel Fishing Reel is one of those products as it gives you a chance to fish anywhere in the world. It’s a fun product but one that also has a very high level of quality. Everything that you need is going to be contained in one place, as it has the reel and line that you need, with the interior compartment for everything that you need in order to catch that fish. It’s a very useful product with a minimal amount of fuss. It’s also a product that is highly versatile. 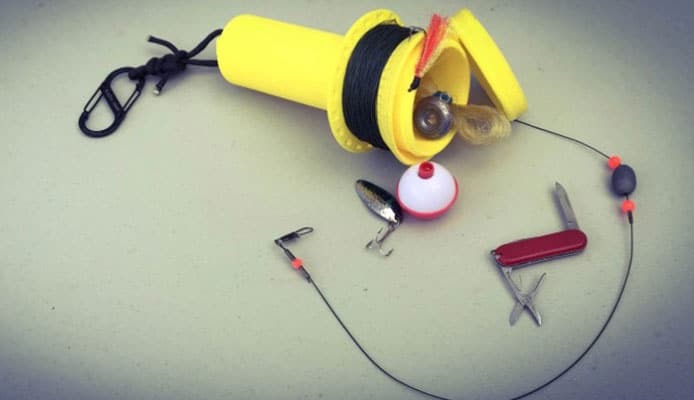 It was originally designed with the intention to be able to fish when you are travelling anywhere is the world, but with the type of product that it is, it can also be perfect for survival kits and emergency situations. How it’s used: As we mentioned earlier, this is a fairly simple device but one that is highly capable of catching fish. Carrying a rod with you when you are travelling or backpacking is never going to be ideal but with this product you can easily travel anywhere with it. 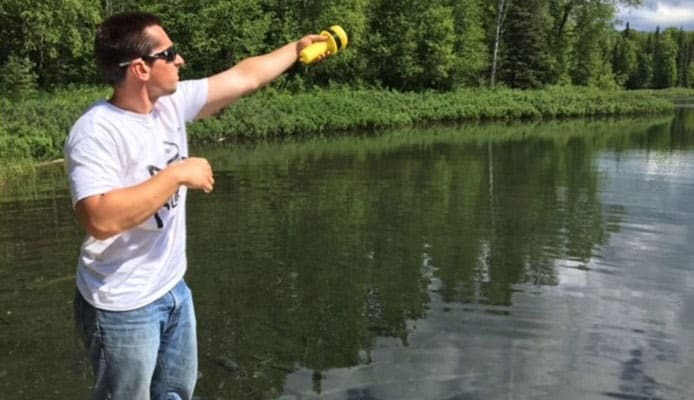 In order to use the device you need to hold the handle in one hand and then you will be able to unravel some fishing line with the other as you get yourself prepared to cast the line. You don’t have any tension from a fishing rod to cast a long distance and therefore you need to do this yourself. This is done by simply swinging the line away from your body to the side, and then casting it into the water like you would do with a lasso. Once the line is in the air, you then point the reel in the direction of the cast to let it unravel. After that you can then turn the reel sideways and reel it in by wrapping it around the upper mid-section. It’s a very easy process and you’ll be soon making long and effective casts into the water. Reeling in the fish is surprisingly easy and it’s a great experience. It doesn’t take long at all to learn the perfect technique for device. 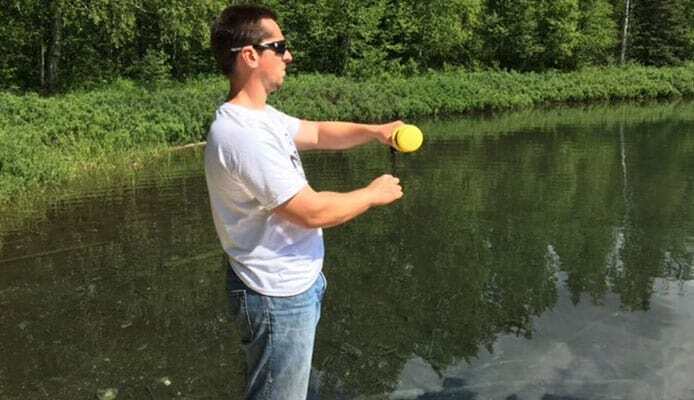 The circular motion to gain momentum has to be done with some caution due to the hook at the end of the line but this is no more dangerous than casting from a regular line. How it travels: The reason this product was made was to travel. Due to the inconvenience of taking a rod with you wherever you go, this device will help you to enjoy your love of fishing wherever you are in the world and will work great with a portable fish finder. Due to its small size, you’d be able to easily pack it into a suitcase with the rest of your belongings but it would also easily fit into a backpack too and is a great alternative to a telescoping fishing rod. That makes it ideal for a number of different activities and you will end up getting a lot of use out of it, and not just when you’re on vacation. Due to its design, there is a large internal space that is available in which you will be able store all of your fishing accessories. The lack of need for additional storage only adds to the convenience of the product as you don’t have to worry about taking numerous boxes. The lack of mechanical parts that it has is also a big advantage, as it means that very little can go wrong with the product. If you were take a rod and reel abroad, for example, then if it goes wrong you’d be stuck with a useless product. Also if you were to break a rod that you had rented, the costs could be very expensive indeed. This product allows you to look past all of that and simply enjoy what you are doing without worrying about anything breaking or anything going wrong. Uses: if you love fishing and you’re going on a vacation you are often presented with two choices and they are either you can simply go without fishing while you are away or you could rent out fishing equipment from a supplier. Going without fishing isn’t a lot of fun and renting gear is very expensive on its own but even more so if anything actually gets broken, as you’ll end up paying far more than you should. This reel solves that issue by being able to bring this simple device with you. Backpacking is another situation where taking this device with you would be absolutely crucial. It will allow you to have a fresh meal wherever you are in the world but it could also become vital in an emergency situation if you ever find yourself without food. Simply having one of these devices in your home is a good way to prepare for disaster and that in itself in a good reason to have it. There are many different uses that you can have for this reel which makes it an even more desirable product. This is a great product and one that is highly effective at fixing the problem that it was intended to solve. The design of the reel is brilliant and the materials are ideal for the job. Here we look at how the reel fares in some key categories. Price: 100% – When it comes to the pricing, this product is very unique and therefore you can’t really compare it anything that’s out there. It has a very fair price though and for a small outlay you’re going to be able to get a brilliant product. Material: 90% – The product works exactly as it is meant to and the high-grade plastic that it uses is going to make sure that it remains durable and will last for the long time. It’s not the highest quality material possible but it does the job perfectly. Design: 95% – This product doesn’t pretend to be something it’s not. It’s never going to replace your rod and it’s not designed for home use. It’s designed to travel and give you the ability to fish anywhere in the world. In that respect, it is very well designed and you can have no complaints. Overall: 95% – This is a very well-priced product that is going to change the amount of fun that you are going to have while you are on your travels. 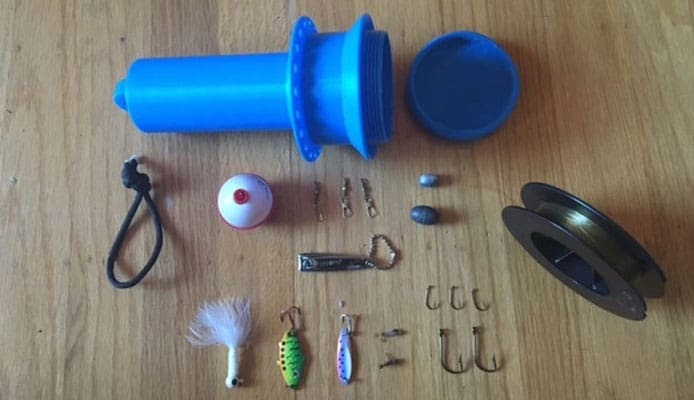 It has taken a problem that many keen anglers have faced and solved it with a genius solution. Overall, you can only be impressed by how it has achieved its goals. You can see this product becoming commonplace in the luggage or backpacks of everyone who loves fishing. Even if you’re not sure if you are going to have the opportunity to use it, the compact design that it has will ensure that you can take it anywhere without it being an inconvenience. It is very easy to use and you will be able to perfect the casting and the reeling in a very short space of time. You’ll soon be able to cast out that line and wait for your fish to take the bait. Once they have, then you’ll have the enjoyment of securing the catch. The internal space for storing the tackle and any accessories is a very useful feature and allows you to have everything that you need in once place. The fact that it has no moving parts also makes the product highly reliable and that is added to by the fact that it feels very solid. The size of the device will mean that you are going to be able to store it in a wide variety of different places. We have mentioned luggage and backpacks, but it would also easily suit others places such as a glove compartment or a kayak. The opportunities are endless and you can only be impressed with the Murray Reel. It’s a highly recommended product that will allow you to enjoy finishing at anytime, anywhere. It’s a great product and it’s one that is sure to impress anyone who sees you using it. Some items come along that you never knew that you needed. The Rivers to Seas Travel Fishing Reel is one of those products as it gives you a chance to fish anywhere in the world.